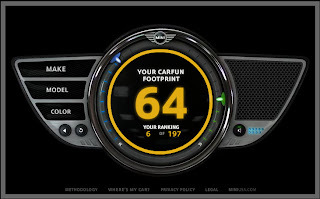 So instead of being bound by a rigid Carbon Footprint calculation, Mini decided to recreate the formula: “Fun to Drive” Factor + Green Factor = Carfun Footprint Score. Even without a hybrid, Mini is looking to position itself better in today’s fuel-efficient consumer mindset and that is what the Carfun Footprint website is all about. What Mini gets right with their Car Fun Footprint calculator are a couple major things. First, they establish a new frame of reference for the consumer by linking green with fun showing how car buyers don’t have to sacrifice style and performance while being cognizant of fuel efficiency, i.e. you can have your cake and eat it too. Another attractive quality is Mini’s competitive angle. While I may not own a Mini, I can at least learn how well my current car stacks up and can send the site to my friends seeing how their cars rank. Of course, if you want to improve your score there is an Improve link that let’s you build & price a new Mini Cooper. An improvement could be a Carfun Footprint challenge with friends instead of just sending the link to a friend. The site could forward your car’s score to your friend and challenge your score against theirs seeing who ranks best on Mini’s site. 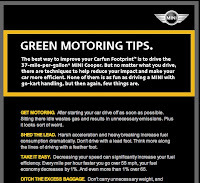 Overall, the site is a great way to demonstrate the fuel efficiency of Mini’s products. In a market that is concerned with fuel economy but not willing to give up everything for it, Mini has hit a cord with their playful Carfun Footprint site.